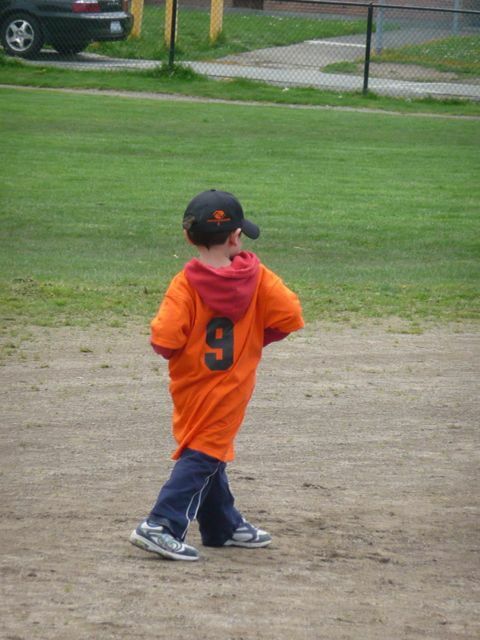 Yesterday was my first Tball game of the season. I've been practicing a lot and like all my teammates and coaches. Daddy's been trying to help too but I told him I didn't want him to talk to me. After a big breakfast of donuts and hashbrowns, we headed out for practice before the game. That's when we got our uniforms and hats. Our color is orange and I'm number 9 since I'm last in the alphabet. After that, we did some warm ups including jumping jacks and running around the bases. We were practicing on the big field so that meant extra running. Everyone needed a donut snack after that. I've also been working on my throwing. Daddy says I have a good arm but I needed to figure out how to use the rest of my body to throw. Using my legs to throw the ball didn't make a lot of sense to me so I had a hard time coordinating my legs and arms at the same time. Then coach came over and showed me how to balance on my back foot and I figured it out after a few tries. Then we were ready to play. Since we only had four players that day, I got to hit cleanup (I guess that's because I help mommy clean the toilets at home). I really like to bat but I still need some practice, especially with the big bats. We don't really keep score in Tball and the other team had lots of little kids so I pretended to hit a homer. I'm not really sure about fielding yet, especially since the other kids on the team are bigger and faster than me so they get to the ball first but there's time to work on that. Yesterday was my first day of T-ball (practice that is). Being April, the weather was unpredictable and we had to wait until One o'clock before Coach sent an all clear email out. Well, I was really excited when we got in the car, (mommy, daddy, and Rachel came too). I had my new BLUE mit and my favorite blue baseball hat on. It took a while to find our field though because there were lots of other kids at the park including some really big kids play fast pitch. That's when I realized that I would have to play with other new kids. Well, I really wasn't excited about that and didn't want to go to T-ball after that. Daddy had to hold me and carry me because I was so scared and shy. Mommy and daddy told me how much fun I would have if I tried it and how nice the other kids were but I didn't believe them. Daddy had me take some big breathes so I would calm down and told me that he would do it with me. Well, that was ok, so I ran around the bases with daddy holding my hand. I made sure he held on really tight from home to first and first to second. But on our way to third, I let go for a little bit and then a little bit more from third to home (which I jumped on!). The second time around was pretty much the same and then we had to bat and run. Well, I let daddy come with me but our coach was really nice so he showed me how to hold the bat and hit the ball right. After I got my big hit then he reminded me that I had to drop the bat and run. I was able to run around the bases all by myself after that with a little cheering from mom, dad, and the other parents. That was pretty helpful when I was practicing my spinning on second base. After that, I told mommy and daddy I was done with t-ball and wanted to play at the playground. But they wouldn't let me. I got to pick flowers for a little bit and then I had to go hit again. But this time, the helmet I got wasn't so big so I only had to use one hand to hold up the helmet when I ran around. Next, it was time to field. Mommy and daddy were a little worried because we had to pair up with another buddy but I found a buddy right away and we had fun throwing the ball with his dad. I was having so much fun that I wanted to play more after coach said practice was over so I made daddy throw the ball with me. Then I saw Rachel playing on the playground so I wanted to play too. I hope a t-ball game will be as fun as practice was. Now that I'm four, I'm old enough to start taking skiiing lessons. Mommy and daddy took me the other week and sent me to ski school for half a day. I got skis and learned to make pizzas and french fries. We even went on the magic carpet! I kept falling down though but it was pretty fun. The best part was when mommy took me to play in the snow afterwards and the snow was taller than I was! At lunch, I ate a piece of pizza bigger than my head and all of mommy's french fries. But I wasn't tired, I stayed awake all the way home and didn't take a nap :-) I'm four now so I don't take naps. Hi everybody, are you ready for Monster Trucks? Well, you'll have to be more patient. I'm going to tell you a cool story. Mommy, Grammy, and I went to a wedding in Missouri for a wedding. I had a lot of fun playing with my cousins and falling asleep. I also ate a lot at Steak and Shake and in a CAVE! Isn't that cool. I had to tell my teachers and friends all about the cave when I got home. I also got a cool blue hat from St Louis. Ok, since you were good, I'll tell you about Monster Jam. It was really cool, there were big trucks and they were really loud but I wasn't scared. My favorite was the blue one. There were lots of other races too but my favorite was when things flipped over. One of the trucks lost its horns. Isn't that funny? Daddy said he would take me again next year. Home Last Updated: Wednesday, August 29, 2012 7:47 AM Email me!